It may be asked why it has been thought profitable to make available a new edition of that version of the Bible commonly known as the Douay-Rheims, when so many other, and more recent, translations of sacred Scripture exist. It may therefore be useful to consider why this translation, first in its original version and then in the revision carried out by Bishop Challoner, has scarcely been t since the New Testament was first published in the sixteenth century. It was some time before the translation which the Douay men produced could be published, and then only in parts. The New Testament was published first in 1582, during the College’s period of residence at Rheims, followed by the Old Testament some twenty-seven years later. It was of a very literal nature, intended to reproduce the character of the Latin as closely as possible, which was “so exact and precise according to the Greeke, both the phrase and the vvord, that delicate Heretikes therfore reprehend it of rudenes”. This was not found a wholly successful approach, and in the middle of the eighteenth century, Bishop Richard Challoner attempted to increase the popularity of the translation by a substantial revision in the direction of a more natural English style. Bishop Challoner was one of the Vicars Apostolic who governed the English Church in the absence of an ordinary Hierarchy, and ruled the London District during perhaps its bleakest period. The fervour of the Elizabethan missions had long departed, and the “Second Spring” was still a hundred years in the future, yet Challoner presided with heroic fidelity over a dwindling and isolated flock. His revision of the Douay-Rheims, which has been in use all over the English-speaking world ever since, is one of the great monuments to his hope for the future of the Church in a missionary land whence all human hope had gone. While Fr. Martin and his collaborators were at work in Douay, Fr. Cesare Baronius was proceeding with his Ecclesiastical Annals at the small church dedicated to St. Jerome in Rome, near Douay’s sister foundation, the Venerable English College. It was the custom of newly-ordained missionaries from the College to ask the blessing of another of the priests there, St. Philip Neri, before they set out to return home. The community at S. Girolamo della Carità was the genesis of the Congregation of the Oratory, erected seven years before the publication of the Douay New Testament. Fr. Baronius, later Cardinal, who succeeded St. Philip as its Provost, had been given by St. Philip the task of writing a complete history of the Church, which would expose the falsehoods of the Protestant Magdeburg Chronicles, just as the Douay-Rheims Bible was intended to correct the biased renderings of many Protestant biblical translations. At a time when dangers to the Catholic faith in English-speaking countries arise principally from internal confusion, “as specially for deciding the doubtes of these daies” concerning revelation and the inspiration of Scripture, it has been thought well to return again to the Church’s authoritative teaching on these subjects, and to a version of the Bible which has served these lands unimpeachably for so long. It is for all these reasons, then, that the first volume that we offer under the patronage of the Ven. Cesare Baronius, is this new edition of the Douay-Rheims, which we hope will be “in such sort as a worke of so great charge and importance requireth”, and which may not be entirely unworthy of the holy men of many centuries through whom its sacred contents have been delivered to us. "The leather-bound Baronius Douay-Rheims is incredibly beautiful in its simplicity. 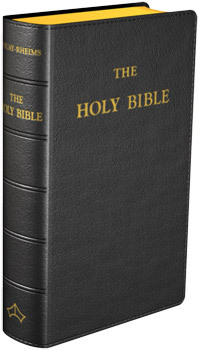 Pocket sized, the Bible is complete with gold-edged pages and two ribbons. The illustrations inside are wonderfully done; neoclassic and awe-inspiring. I have never been a fan of "realist" religious art. I simply do not care what a Biblical scene "actually looked like" because it is more important to focus on what is going on beyond the mere physical appearances of those present. The Douay-Rheims illustrations communicate the sense that there is something important, and even earth-changing, in each etching. This sense of reverence goes to the heart of why so many Catholics still appreciate the Douay-Rheims translation.…"
We carefully choose fonts for our titles in order that our books are readable even by those with eyesight impairments. It is important to know that the font size alone is not a good indication as to whether a text is easy to read. Whilst we do not mind disclosing this information, we encourage our customers to print out a sample page of the title they are interested in to see whether the text size is acceptable to them.